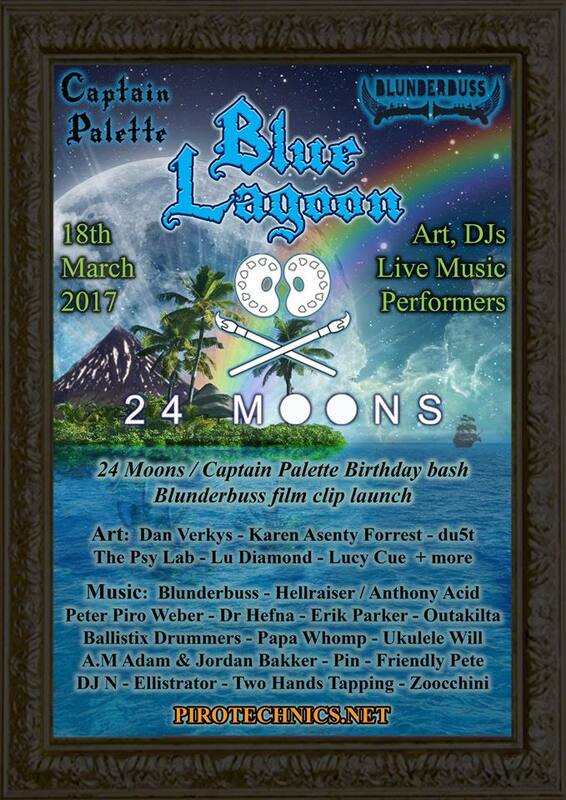 Captain Palette – Blue Lagoon @ 24 Moons! Captain Palette – Blue Lagoon! All in one spectacular Island themed party! Tropical, Pirates, Mermaids, Sea dragons, Island warriors, underwater creatures, Tiki, beach wear, snorkeling gear and anything creative! PAPA WHOMP – Farewell Aus set. House Of Pyro – glow & fire show. Best costume prize & much more! Blue Lagoon, It’s coming soon. A tropical island in 24 moons! the melody flies and the beats flow. We’ll have Captain Palette sail the ship. While Pirates fight with sword and whip. Blunderbuss launch their new film clip! as mermaids take you on a wild trip. Birthday celebrations, we’ve got a few. 24 Moons is turning Two. Get dressed up and join the crew. Drinks for all, come have a brew. You’ll feel like a pirate king or queen. We’ll see you on March 18! $20 before Midnight / any time if in costume. comments: Comments Off on Captain Palette – Blue Lagoon @ 24 Moons! 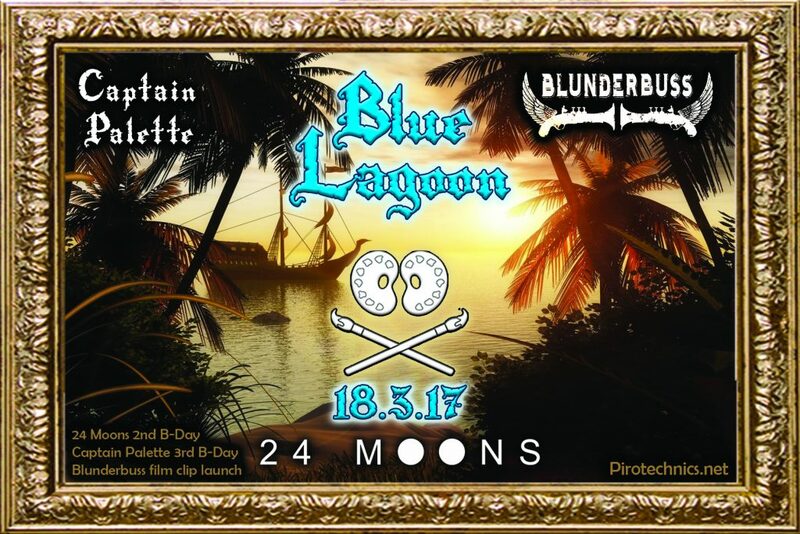 Captain Palette, 24 Moons, Blunderbuss, Pirainia and friends proudly present Blue Lagoon! Tropical, Pirates, Mermaids, Sea dragons, Island warriors, underwater creatures, Tiki, beach wear, snorkeling gear, swim ware, sharks or anything creative! More on the door if not sold out. Captain Palette – palette art gallery space. Check out the facebook event page https://www.facebook.com/events/722598724589368/ for more details announced soon. comments: Comments Off on Captain Palette – Blue Lagoon! PTG 2016 – Pirainia Tribal Gathering. We’re excited to have you join us this weekend for PTG 2016! 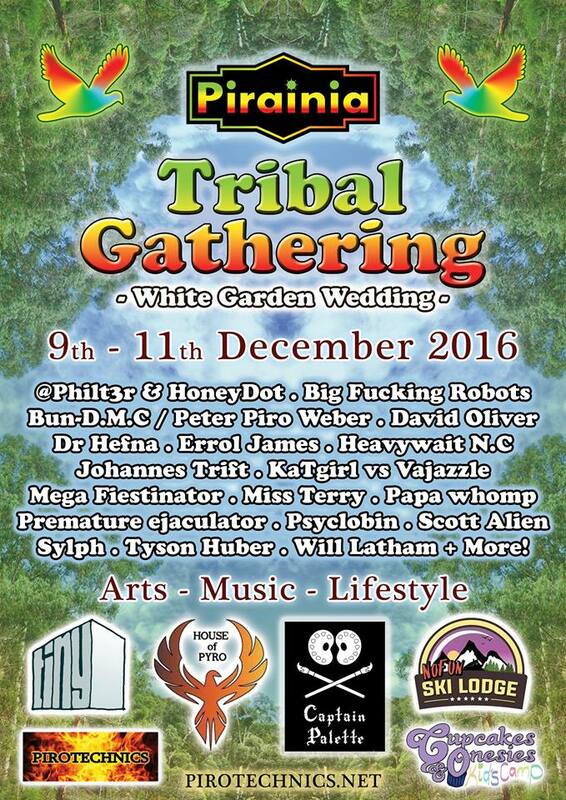 Pirainia Tribal Gathering is going to be an epic and beautiful experience. Please note this will be a private community focused gathering so read the following info to make sure you are in the know. Pirainia Tribal Gathering is strictly pre-sale tickets only and you must bring a print out of your ticket. Our community must respect the environment. We are committed to leaving no physical trace of our activities wherever we gather. We must clean up after ourselves, take all our rubbish home with us and leave the camp site in a better state than when we found it. First Aid kit: You are responsible for your own health and saftey. Anyone under 18 must be accompanied by a parent or legal guardian at all times! We will have a sign in form for Parents or legal guardians to fill out at the front gate. 2 Will Latham – Live. 12 Peter Piro Weber + House of Pyro fire show. Bring enough food and drink for yourself as there will not be any food stalls. We will however be featuring the Pirainia camp kitchen. Come join us as we’ll be gifting free snacks, fruit, breakfast cereals, tea and coffee! Make sure you bring your own cups, plates, bowls & cutlery! If you can, bring some extra food to share. Sharing food and drinks together while in such a beautiful place, with amazing community may be simple but it really is one of the greatest things in life. We are pleased to let you all know Pirainia Tribal Gathering will be at Moira Park scout camp! 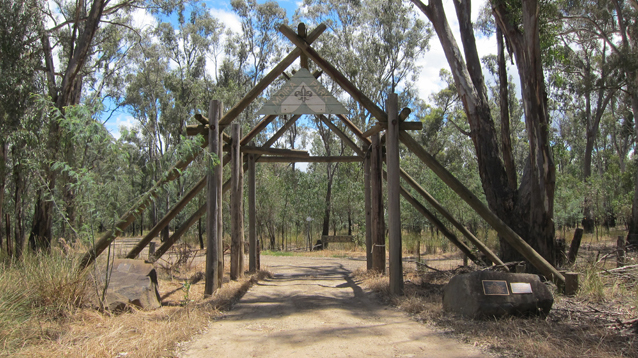 The entrance to Moira Park is located at the end of Moira drive in Kialla West. Coming from Melbourne you will turn left onto Moira drive and drive to the park entrance sign. Continue on the Nadzab Track (to the left) until you reach the scout camp. As this is a Private Gathering for ticket holders only, Please do not repost the location publically or on any social media. Picture above: Moira park entrance sign. This Gathering has been registered with the local CFA and police. We intend to work together with the local police to provide a safe environment for everyone. Sections of the camp have been fitted with security cameras for your protection. In consideration of being allowed to participate in and attend the 2016 Pirainia Tribal Gathering, You agree to comply with any and all rules, regulations, terms, and conditions of the Pirainia Tribal Gathering. YOU KNOWINGLY AND VOLUNTARILY ASSUME ALL RISK OF PROPERTY LOSS, PERSONAL INJURY, SERIOUS INJURY, OR DEATH, WHICH MAY OCCUR BY ATTENDING THE 2016 PIRAINIA TRIBAL GATHERING, AND HEREBY FOREVER RELEASE, DISCHARGE, AND HOLD PIRAINIA TRIBAL GATHERING HARMLESS FROM ANY CLAIM ARISING FROM SUCH RISK, EVEN IF ARISING FROM THE NEGLIGENCE OF PIRAINIA TRIBAL GATHERING, OR FROM THIRD PARTIES, AND YOU ASSUME FULL RESPONSIBILITY AND LIABILITY FOR YOUR PARTICIPATION. comments: Comments Off on PTG 2016 – Pirainia Tribal Gathering. Pirainia – A space odyssey! 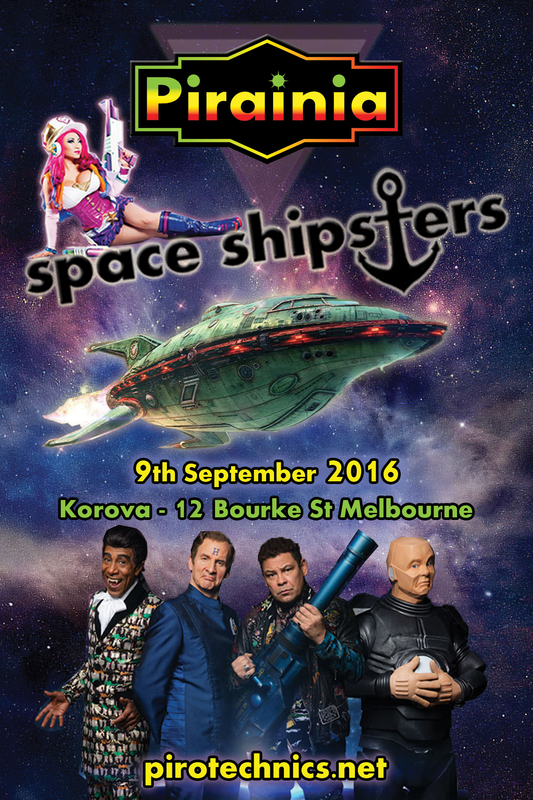 Dress code: Space theme! Futuristic, sci fi, cyber steampunk, cyber goth. neo victorian. Grab your space suit and get ready to blast off! TICKETS AVAILABLE AT THE DOOR – $25. *Set times are subject to change and may be effected by warp speed or time travel. Every dollar raised from this event will go towards the costs of helping the Pirainia Theme Camp return to Burning Seed in 2016! comments: Comments Off on Pirainia A Space Odyssey! “The year is 2042 and the earth is in danger! Earth has become over run by mindless media zombies, clean drinking water is more rare than a drop bear, politicians fly everywhere in helicopters funded by taxpayers and unleaded petrol costs $42 per litre! The crew of the star ship Pirainia are preparing for their journey into deep space, to try and find the promised land on the lost planet of Pirainiastan. Before they can blast off however, they must find passengers to join them for the journey and to help set up a new civilization on the promised land. After searching for passengers in the present year of 2042, all they can find are slaves to the rent trap caught in prisons called “jobs” and victims of the corrupt pharmaceutical industry, whose minds have been taken over and impregnated with a belief that a chemical called depioidressative is their only salvation. Please note: This space theme fund raiser is for our Burning seed theme camp. Every dollar raised from this event will go towards the costs of helping the Pirainia Theme Camp return to Burning Seed in 2016! 1st round Early Bird SOLD OUT! As the theme for Burning Seed this year is “Deep Space”, What better way to test out some costume ideas than with a deep space theme fund raiser. Pirotechnics Events is turning 10! 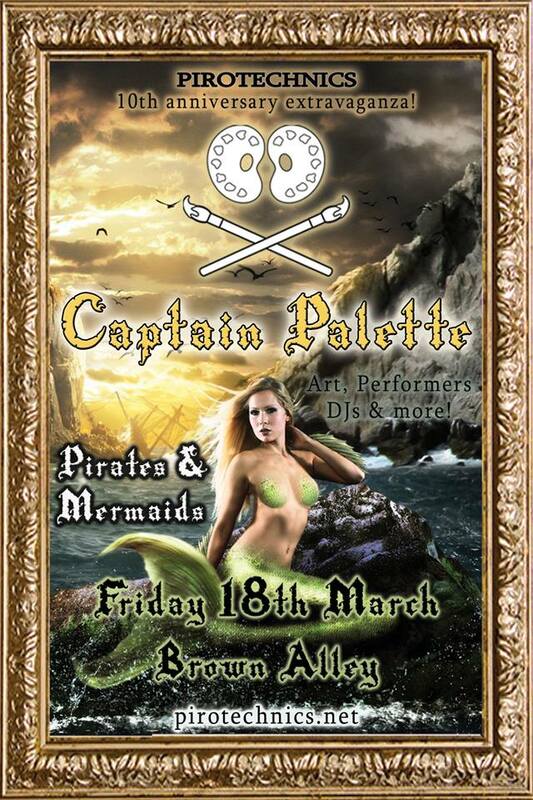 Captain Palette – Pirates & Mermaids! Get dressed up in your best Pirate or Mermaid outfit and join us for a Captain Palette Fundraiser, exhibition and celebration of ART! It’s hard to believe but for the last 10 years Pirotechnics events has been rocking dancefloors and pushing the boundaries to bring you top quality events with a twist. So now we’re bringing you an event so epic it’s been 10 years in the making! From humble beginnings in 2006 with our first event “Peppermint @ the Apartment”, it was a drop in a lake that created a ripple which is still going today. Over the years Peppermint had a total of 19 classic Peppermint parties @ the Apartment with its infamous Hot tub on the rooftop. 2006 also saw the 1st “Toons Alive” party at Eurotrash. In later years this became a regular event blowing the roof off many great venues. 2007, 2008 & 2009 saw Room 680 & Inflation host Toons Alive – The Psycho Circus! A circus spectacular complete with sword & fluorescent light tube swallowing, magicians, jugglers, clowns & all sorts of side show fun. In 2010 & 2011 @ RMH & Room 680 we hosted Toons Alive – Tranceplant! A medical theme party full of doctor, nurses, patients & play. Moving outdoors, in 2010 Pirotehcnics events with the help of some friends and other crews started “P.R.O.D – Peoples Republic Of Doof” which was a party run by the people, for the people. 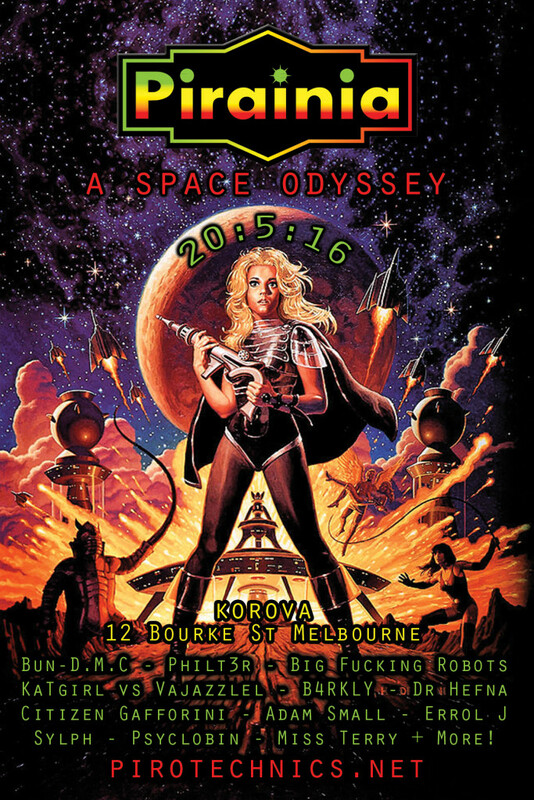 Other event series from 2009 – 2012 such as Inpsyt, perfect excuse & mushroom cup @ CBD and the outdoor Doof series of Canarcy parties also helped shape the future of Pirotechnics events as we know it today. Burning for new adventures, 2011 Saw Pirotechnics events first Burning Seed Theme Camp A.I.P – Anything is paintable. An artistic theme camp with a focus on self-expression through painting. In 2012 Pirotehcnics events pushed the boundaries even further and started WPW – World Party Wrestling. The 3 WPW events @ Room 680 combined a crazy live Pro-wrestling show, Burlesque, DJs, Fire shows, Cabaret and circus performers. Years after its original concept, in 2013 Pirainia became a Theme Camp and Art installation. The Pirainia concept has now evolved into much bigger Art Spaces, Theme Camps, Food Stalls and even its own Outdoor Tribal Gathering! Pirotechnics Events newest concept of Captain Palette came to be in 2014 @ Genral Store & co as a weekly Arts Hub with its own Palette Gallery Space! In 2015 Captain Palette changed from being a weekly Art Hub and instead did 3 bigger special events. So after 10 years of epic fun, 2016 is here and on March 18th Pirotechnics events will celebrate with a Captain Palette Extravaganza! 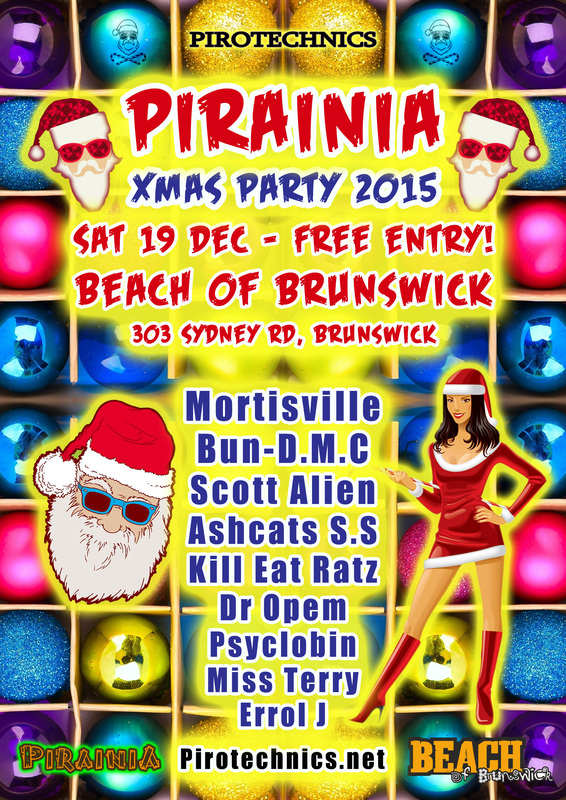 comments: Comments Off on Pirainia Christmas party 2015! 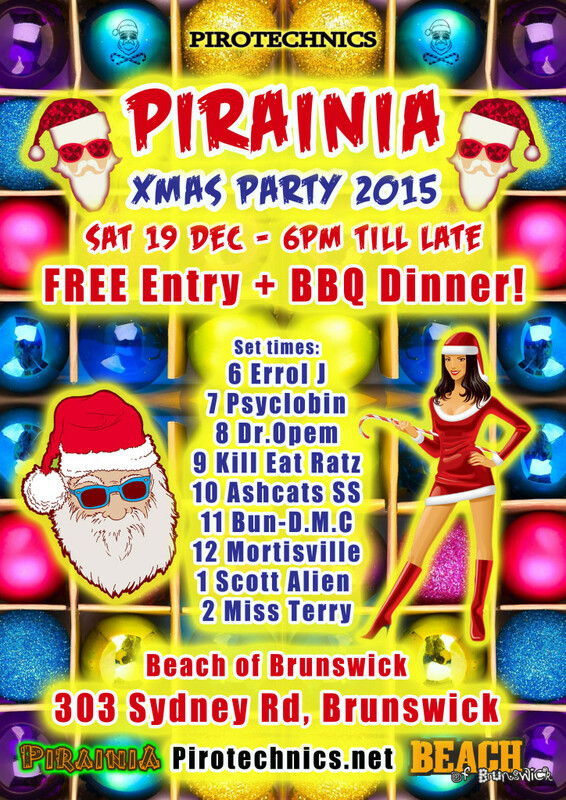 It’s the Pirainia Christmas party 2015! Food & Fundraising: In true aussie tradition we will be have a festive season bbq! We will be selling vegetarian food and unicorn meat to raise funds for our theme camp so let’s enjoy a tasty meal together.